Every year Father Andrew calls all of the students and teachers to the front of the parish the Sunday before school begins to give them a blessing and say some words to them about the coming school year, the culture, and how they are expected to behave as Orthodox Christians in a decidedly non-Orthodox culture. Every year, I am stunned at how many come forward. There are a couple of teachers and college kids in this photo, but most of those pictured are elementary, middle and high school kids. It shouldn't surprise me. 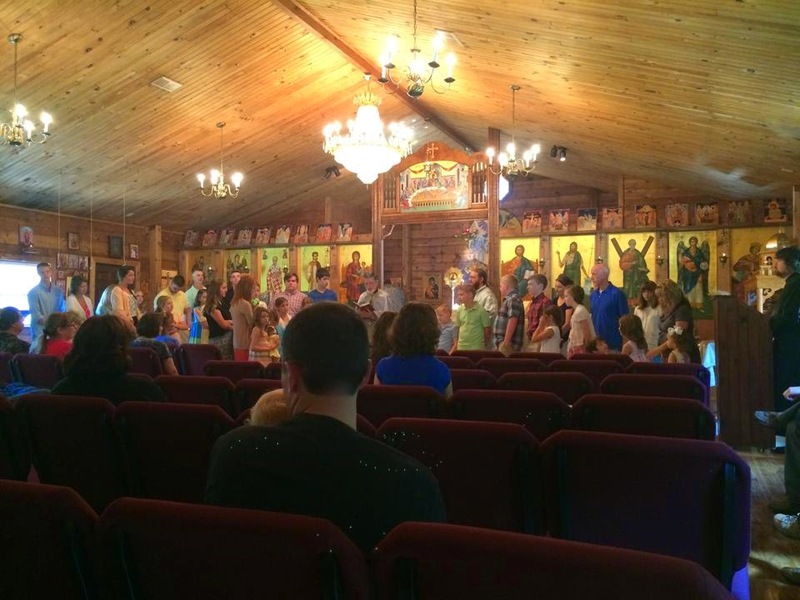 After all, one of the reasons we joined this parish is that kids are encouraged from the very earliest age to be in the Divine Liturgy, as I noted several years ago in this post. I should report as a follow-up that Emily is much better behaved after nearly 4 years of consistent attendance. We also pack up a bunch of those kids every year and send them to Camp St. Thekla to spend a week having fun and learning about the faith from some wonderful priests, deacons and bishops who devote their time to our youth. But it still surprises me how quickly the chairs empty when those kids go to the front of the Church when school starts. One of the sad things I encountered in our previous traditions is the rise of the so-called "Church Growth Movement." We were told that youth do not appreciate traditional forms, and so we must change up the Church's worship practices and even her theology in order to "reach the lost." What I see, however, does not square with that claim. What I see is a bunch of baby boomers who tailor the worship service to their whims, their tastes, their wants and desires. And predictably, those traditional parishes that switch to this type of model end up as revolving doors, where a lot of people come through but few stick. This was detailed a few years back when Bill Hybels and the Willow Creek Association did a study, and found that they were very good at getting people in the door, but not very good at leading those people to lead spiritually fulfilling lives. Hybels was quoted in Christianity Today summarizing the findings as follows: "Some of the stuff that we have put millions of dollars into thinking it would really help our people grow and develop spiritually, when the data actually came back, it wasn't helping people that much. Other things that we didn't put that much money into and didn't put much staff against is stuff our people are crying out for." Well……yeah! I still contend our parish model is the better approach. We don't grow a huge parish. We have maybe 100-150 people at most in a given service. But the thing is, if every little parish followed our model, we'd have a lot fewer rich and famous pastors, but a lot more faithful Christians. We have some who come and go, but most attend weekly. We have good participation in our after Church activities like our fellowship lunch every Sunday (most of our parish is at the Church for at least 3-4 hours on Sunday, and those who faithfully attend Matins before the Liturgy are there between 4-5 hours). We have great participation in youth events and special events like our Fall Festival and so forth. But what we have in abundance is people who stick. People raise their families here. They become Orthodox Christians and, with rare exception, they remain Orthodox Christians. And -- here is the Church Growth principle at work -- they raise their children as Orthodox, and again with rare exception, they remain Orthodox. Our college students come back when they are on break. They attend services. Holy Week is full of college students and children of members who have grown up and moved away. Nativity is as well. We do other types of outreach. Most of it is organic, like the college student I spoke to this weekend before Vespers who keeps icons in her dorm room, or the parishioner I spoke to who is always presenting Orthodoxy to his frustrated Protestant friends in a welcoming, but not proselytizing way. But the single best way to reach the lost is to not lose the reached. That starts by having kids, raising them in a faith that is real, concrete, reliable, and stands the test of time. And then having those kids grow up into faithful Orthodox Christians who spread that light to the rest of the world, starting with their own future spouses and children. This is how the Church has always grown. She makes disciples, baptizing them (starting as children), and teaching them to obey all Christ has commanded. This is Church Growth. The rest is just marketing. Interesting post. I attend a Continuing Anglican church (Anglican Province of America). We are a small parish with a typical weekly attendance of 30 faithful souls - mostly elderly. But I wouldn't exchange our church model for the church growth movement (CGM). The CGM is a mile wide and an inch deep. It changes with the cultural winds. It's not for me. Our little church may not make it, but I'll stick it out as long as we adhere to traditional liturgy and theology and can pay the bills. Your point about younger folks staying with Orthodoxy if sincerely brought up in the faith has not been true with my wife and many of her family and friends from the church of her youth. My wife was faithfully raised in the Orthodox church but has little interest in returning. I don't understand all her reasoning but she believes her home church was primarily an ethnic enclave. The lives of many members were no different than an unbeliever. This truly bothered her - as it should. We talk about how many children from her Orthodox counterparts are no longer Orthodox. Most attend no church at all. Sad. I enjoy your blog. May your parish grow with sincere disciples of Christ who impact our culture and world for His glory. Thank you so much for the kind words, James. Ethnic enclaves are certainly a real issue in Orthodoxy, but obviously I think we would agree that the answer to phyletism is not sectarian worship forms. You and your wife will be in our prayers. Hi, David. I have I have become aware of you over at ALPB, and have always been impressed with your wisdom. And I couldn't agree more with what you write hear. "Train up a child in the way he should go; even when he is old he will not depart from it." Proverbs 22:6 I staunchly believe this and completely share your thoughts on worship and reject CGM. We Lutherans completely lost when you left us. God's blessings on your ministry. Thank you also for the kind words, Jason. I rejoice that there are many solid, faithful Lutherans still fighting the good fight. We simply couldn't find any where we live, so we were forced to look elsewhere. And blessedly so -- I wouldn't change it for anything. But I also mourn the fact that good, faithful Lutherans like yourself may one day find themselves in a situation with significantly limited options for finding a good, faithful Lutheran parish.